If you have been a mariner/boater/skipper for a long time you certainly have a memory of a time when you pushed your luck and it almost cost you your life. You survived, but only because you kept your wits about you, knew what to do, and survived. So, here's your chance to relate "that one time" to the rest of us. For me, it was a time in the 60's when I was about 13 or 14 years old. We had a cottage on Lake Huron and I spent my summers on my Alcort Sailfish. That boat and I were like a part of each other I was so familiar with how it handled. I was out one day with my girlfriend just cruising along with a moderate wind of about 10-15kts. Perfect for a Sailfish. We were about 1/2 mile or so offshore when all of a sudden the wind just died. I had been around water and sailed enough to know that was not a good sign. As I looked over my shoulder to the north I could see the reason the wind died. There was a storm front that stretched all across the horizon. It was still a ways off but I figured we had zero chance of getting to shore. The winds didn't frighten me as I'd sailed in some pretty stout winds. What scared the bejesus out of me was the lightening. I dropped the mast and lashed the mast, spar and boom to the hull using the mainsheet. Then we flipped the boat over so the metal parts would be beneath the boat. We tied ourselves off using another line and, wearing only our ski belts (remember those?) we floated about 25' away from the boat. We held onto each other for about 30 minutes in hellatious winds with 3'-4' seas and whitecaps until the storm blew over. Afterwards we hoisted the sails and sailed back to shore. Boy did we ever catch hell for being out there in that storm. It had blown down some trees, blew the covers off some boat lifts and just made a mess of things. No amount of explaining how "safe" we made ourselves would pacify our parents, but I knew in my heart that what I'd done had made us safer. "Hey, if I'm a Vice Admiral, which vice do I get to claim?" and the engine problem? Loose wire on the ignition switch. Gaahh. I had many close calls in my young stupid days. But I will never forget driving this thing on a windy day. A big cruiser went by leaving giant wakes. My eyes lit up so I punched it as the wake approach. Since I was going against the wind, my hull caught air and went straight up like a rocket being launched. Luckily, when the prop went back into the water, it slowly pushed the bow back down. I was expecting to flip backwards. Cooler and all contents of this little boat were in the water. My scariest boating moment was while I was on a dock. This particular dock is unusual as it is NOT in a no wake zone - it is actually on a point and boats can drive by at speed just a few feet away (the dock is designed to be a floating break wall, not really a good idea IMHO). Anyway, I was walking along the dock when a huge wave of water knocked me completely off my feet and nearly into the water. I got up to my feet wondering what the hell just happened (I literally had no idea what hit me). I looked around and everything is soaking wet, the water all around the dock is turbulent and all of the boats in the slips were rocking violently. I then noticed the group of people on the dock that I had just walked passed were also soaking wet and not happy. Then I noticed that a go fast boat was now floating on the outside of the dock right next to me (I swear it was not there before I got knocked to my feet). The driver looked to be in a good bit of pain, holding his ribs. I knew some of the people in the group of soaking wet people and asked them what the hell had just happened. Turns out the driver of the go fast was looking to impress some folks on the dock and chose to perform a high speed 180 maneuver in front of the dock. Apparently, the boat approached from behind me at speed when the driver threw the boat into a hard turn to starboard to affect a 180 spin. The boat did a 180 immediately adjacent to the dock (right behind me) and came to a rest parallel to the dock (close enough to tie up). The spin was so violent that it threw the driver out of his seat and onto the port side of the boat, breaking several of his ribs. Amazingly, no one other than the driver was injured. There was a guy at Willard Bay back in the 70's, had a real pretty dark lime green picklefork, big block, chrome Bassett's, Berkeley with the Jetovator... I was sitting on the sand watching him throw 100 yard rooster tails... then he comes in, and I guess I'm in his spot because he's coming straight at me. At about the 50 yards away mark, I notice he's still WOT and I'm about to die if I don't move! I got up and started backpedaling, and finally I hear the engine roll down, then he grabs the handle, pulls it down and romps it again... 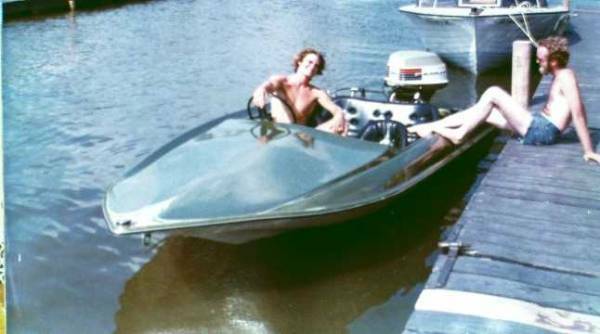 The a$$-end came up and the nose submarined, shooting tons of water up and out, like a huge reverse waterfall, and just drowned everyone in the boat! -- And then the boat gently settled onto the sand.